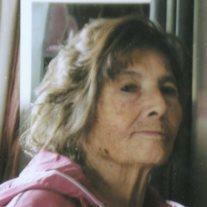 Matilde Alvarez Cañez de Cañez of Mesa, AZ passed away suddenly on March 1, 2014 at the age of 93. Matilde was born on October 29, 1920 to Santiago Perez Cañez and Carmen Alvarez in San Miguel de Horcasitas, Sonora, Mexico. She married Rodolfo Acedo Cañez in Imuris, Sonora, Mexico on March 10, 1943 and had four boys. In 1950 she moved with her husband and sons to Superior, Arizona where they had six more children. She loved being a mother and homemaker. She took pride in her role and was excellent raising her ten children. She also raised some of her grandchildren and was the go to person for home remedies when they were sick. Matilde was known for her tortilla making and by word of mouth she was asked to be featured in the Mesa Tribune. In the article she talked about how tortilla making was a source of pride and a lost art. She was a dynamic woman who loved life to the fullest. She was a traveler, loved flying and fought for the window seat. She was a lover of animals, baseball, “la perrica”, crossword puzzles, music, cooking, dancing, her “chuchupate” and had a green thumb. Matilde is survived by her sons, Rodolfo “Rudy” Jr., Ramon (Margarita), Santiago, Arnoldo; daughters, Ofelia, Herlinda and Matilde; daughter-in-law, Anita De Anda Cañez, 25 grandchildren, 24 great-grandchildren and 6 great-great-grandchildren and caregiver Francisca. She was preceded in death by her husband, Rodolfo Acedo Cañez; brothers, Santiago, Antonio, Jose, Jesus Maria, Carlos and Francisco; sisters: Carmen de Gracia and Rosario C. Acedo, and by her loving sons, José, Rogelio and Bernardo and grandson, Richard. She also leaves hundreds of extended family members and friends. She was the matriarch of our family and she will be incredibly missed. She will never be forgotten. Her spirit will live in each of us always and forever. Viewing and Rosary will be held at Bunker’s University Chapel, 3529 E. University Drive, Mesa, AZ on Thursday, March 6, 2014 from 5-8 PM. Mass will be at Queen of Peace Catholic Church,141 E. 1st Street, Mesa, AZ on Friday, March 7, 2014 at 10 AM. Burial will follow at City of Mesa Cemetery.